Welcome to the Steve Jobs based Join Up Dots Free Podcast Interview with Mr Ryan Avery. Todays guest, joining us on the Join Up Dots free podcast interview is Ryan Avery, a man who at the age of 25 took on the world at public speaking and came out top. 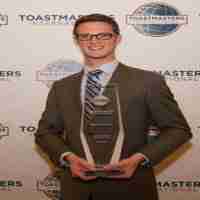 Yes, he beat 30,000 people to claim the title of the youngest World Champion of Public Speaking in history. Contestants came from 116 countries and didn’t stand chance as they were up against our guy. They should have seen him and not bothered to even unpack their suitcases. But what made his speech so powerful? What made it a world beater? Well for one Ryan Avery was true to himself, and also spoke about a subject that resonates with the whole world. But coming from Humble, Texas a suburb of Houston it was not predestined that he was going to be a world beater. So lets see how we can all improve our skills at connecting, as we start joining up dots with the one and only Ryan Avery. How he learnt from his parents that if you want something you have to go for it, nobody else will give it to you! How he believes that he absorbed the hustle muscle from his Mother and Father and as such was destined for the life of an entrepreneur! The reasons why we should delete the words “Just” and “Only” from all of our vocabularies to start making true progress in our lives! How when he is on stage he makes sure that he believes in himself, he doesn’t care what people think of him, and that he has nothing to lose.